Two young boys come to the aid of a fugitive. 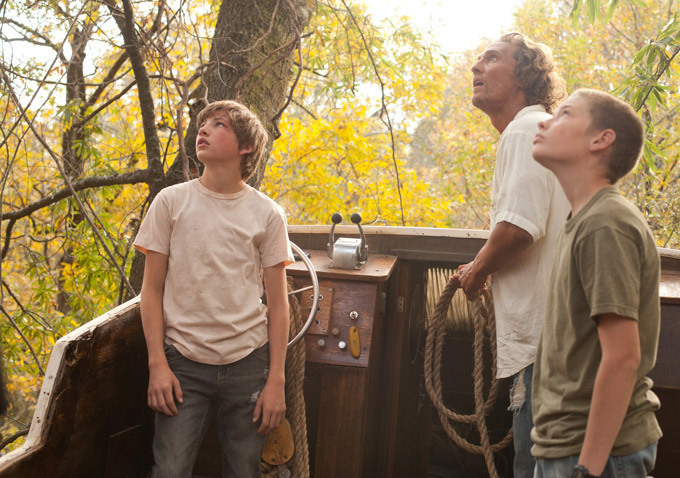 Two 14-year-old Arkansan boys, Ellis (Sheridan) and Neckbone (Lofland), discover a mysterious stranger, who calls himself 'Mud' (McConaughey), hiding out on a small island on the Mississippi river. When he tells them he's waiting to be reunited with the love of his life, Juniper (Witherspoon), the boys scoff until they see the woman buying groceries in town. With his own parents on the verge of divorce and his first love having just rejected him, Ellis sets about reuniting the two lovers. He soon discovers there are those who aren't so keen; a group of thugs employed by the father of Juniper's abusive boyfriend who died at the hands of Mud. There was a time when the U.S led the world in narrative film-making. Whatever other faults you might have bestowed on them, American film-makers were traditionally cinema's greatest story-tellers. This tradition was partly killed off in the late sixties by the "movie brat" generation who saw conventional narrative film-making as old hat. By the 21st century the tradition was practically dead, with European and Asian writers leading the way as far as story structure went. The odd contemporary American movie with a well written and engaging story, such as 'The Shawshank Redemption' would come to be treated as manna from heaven but, pre-sixties, America produced these type of films on a weekly basis. Jeff Nichols' third feature, following the over-rated but promising 'Shotgun Stories' and 'Take Shelter', is a return to this tradition, a piece of old school American storytelling at its best. When we think of American culture, we're more often than not thinking of the South. Most of the country's greatest writers, artists and musicians have come from below the Mason-Dixon line but the area hasn't fared so well on celluloid. The South usually falls victim to a cornball representation, with dodgy Northern actors attempting wildly over-the-top accents. Last year we had two of the worst representations of the South, one mocking ('Django Unchained'), one patronizing ('Beasts of the Southern Wild'). Nichols is a child of the South and the Arkansas we see in his films is not the one we know from the silver screen, rather the one seen by everyday folks from the back of a pick-up truck. He does for the South what David Lynch did for the Pacific NorthWest, representing its rugged beauty alongside its underlying darkness. Indeed, the theme of first love set against the dangers of the adult world explicitly recalls Lynch's 'Blue Velvet'. The film's villains, all skinny ties and slicked back hair, are straight out of Lynchland, that enticing world where America seems stuck in the fifties. If you had told me the best movie of 2013 would star McConaughey and Witherspoon I would have feared for the state of cinema. A whole generation has grown up without the knowledge that, back in the nineties, the pair were considered two of the brightest lights of American independent cinema. A decade-plus of dreadful (un)romantic-comedies has since soured our perception of them. Here they get the chance to remind us of their potential with career best performances from both. Speaking of potential, young Sheridan shows us that his impressive turn in 'The Tree of Life' wasn't just a once off. Himself and Lofland are fantastic together, a double act way beyond their years but still convincing as naive teens. 'Mud' is easily the best movie about childhood since 'Stand By Me', a stunning portrayal of the confusion of entering manhood in a post-masculine world. There's no sagely, wise-beyond-his-years, advice from Nichols' protagonist Ellis. He sees the errors adults are making but, already at his young age, he is making the same mistakes himself and his youthful ideals are crushed by three different failing relationships throughout the film. There's no annoying voice-over telling us the lessons Ellis is learning, indeed the film's climax suggests no matter how many times he feels love's hoof in his belly, he'll keep climbing back on the horse. Like 'To the Wonder', Nichols' film tells us love, or at least its unattainable ideal, is worth fighting for, even if we're never really sure why.